Have you turned on the heating yet? I have. We’re having thermostat difficulties but I’ll get over it. Every single year without fail I have heating problems. Last year we installed a new boiler (gas) and it has proved to be a lot more efficient than the previous beast with our bills are greatly reduced – though that might have something to do with the thermostat difficulties. Sigh. So yes, comfort and all things mash are called for. One of my favourite vegetables to mash is parsnip, I love it with carrot or with apple and here I have it with some buttery softened leeks – delicious. Besides the chill factor there’s also the teen factor and this week has been particularly precarious – there are 6 of them aged from 13 to 18 – and to suffice it to say that this week we have been far from the Waltons. I watched a movie recently (so dreadful I can’t remember the name) that had one scene that struck a chord, a man contemplating imminent fatherhood asked his friend what parenthood was like and he replied that it was ‘Awful, awful, awful and then something happens that is so beyond amazing that you think yes, this is what it’s all for….. and then it reverts again to awful, awful, awful.’ Ok so it’s not that bad and I do remember the angst and frustration of being a teenager myself but there have been moments where parenthood has been just awful! So besides heating you up internally I find that a bowl of delicious mash comforts and warms you up emotionally. A bowl of delicious mash is your friend. Heat the butter in a frying pan over a medium heat and add the rinsed and finely chopped leeks to soften for around 5 minutes. Meanwhile peel, chop and boil the parsnips in a saucepan of boiling water until tender enough to mash. Drain the parsnips and mash with the buttery leeks and some more butter. 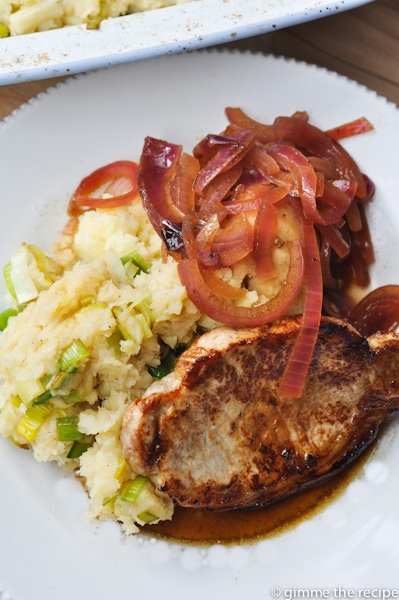 Serve on its own or as pictured with a side of pork chop, red onion gravy and a mashed potatoes. Posted in: Recipes, What's for Dinner Mom? | Tagged: food, Irish Food, Irish Food Blog, Irish Food Blog Awards, Parsnip & Leek Mash, recipes, What's for Dinner Mom? This sounds yum, will definitely try it!